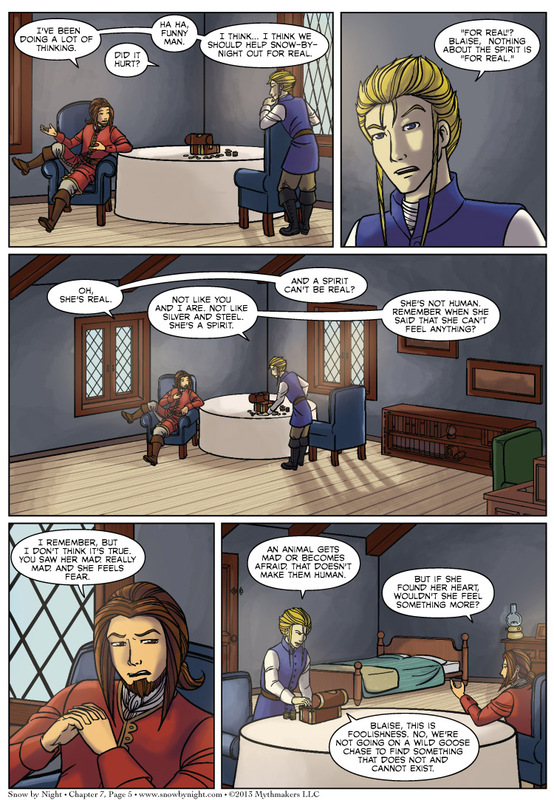 Blaise makes a request of Jassart which goes about as well as you would expect on Chapter 7 Page 5. Blaise is also suspicious of Snow-by-Night’s claim that she can’t feel anything. Is he on to something? We’ll have to find out. To see a glimpse of the next page, please vote for Snow by Night on Top Web Comics. Otakon – our biggest show of the year – is rapidly approaching. We’ll be at table W-12 on this handy-dandy Map of Otakon’s Artist’s Alley. We’re right beside Julie Wright of Ianua and Whitney Delaglilo of Prism the Miracle. It’s a webcomic wonderland. Great metaphor for the battle (it is a battle) between those who believe life can be summarized by wealth and possessions vs the ones who understand life is more than what one “has” it is equally, or even more importantly, about who one “is” and their connections/interactions with others. Nice! Then you’re going to love the rest of this scene.